Higgledy Flower School 2016. #25. Malope trifida ‘Vulcan’. This magenta beauty is becoming more popular in cut flower patches up and down our fair Kingdom. A profusion of flowers pour out of this amazing plant and they have stunning lime green star at the centre. Growing to about three foot this mallow will bring you great joy and admiration from neighbours and tradespeople who gaze upon it’s magnificence….and to top it all…the flowers themselves are edible. 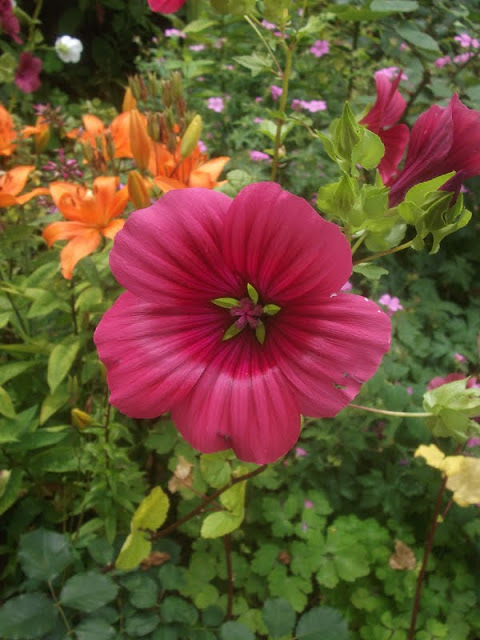 My Malope ‘Vulcan’ Patch….this was 2014 I think….there’s about 7 or 8 plants here. Back in the day I used to grow flowers for the local hippy/health food shop….it was always well stocked with patchouli scented lasses who would make cooing noises when I delivered bucket loads of fresh flowers to the shop. 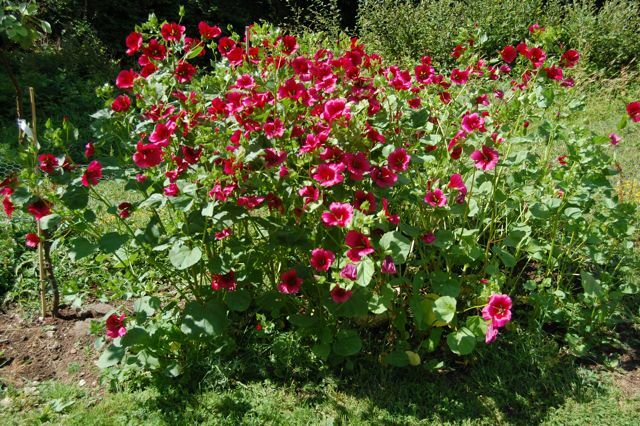 The staff had a big liking for Malope trifida ‘Vulcan’ and so I would grow heaps of it for them in the vain hope they would return a 70’s style love-in…no such luck…plenty of vegan quiche and monkey friendly laundry powder but no rolling around with braided haired beauties. However…not one to give up easily….though ten years have passed and I’ve moved 400 miles away…I still grow a decent sized patch of Malope…just in case. 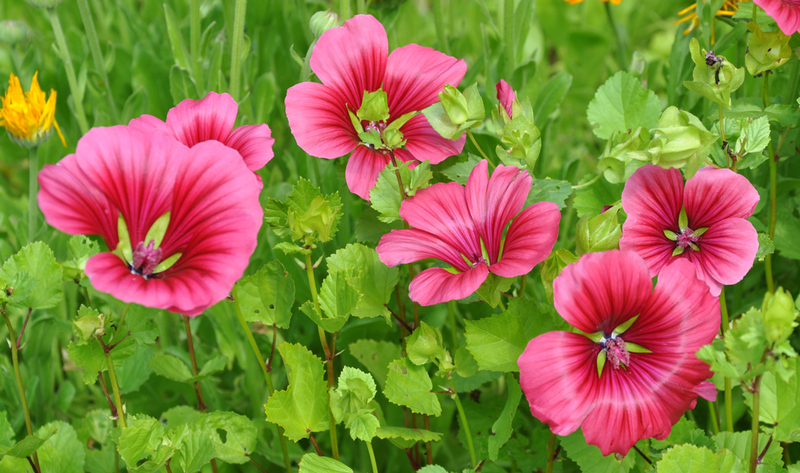 How To Sow And Grow Malope. *You can direct sow straight into the soil outside after the frosts have done their worst….about mid May. Thin your seedlings to about a foot and a half apart….or perhaps a little less. *Or sow some earlier in modules….I sow some at the beginning of April….then plant them out six to eight weeks later….check the forecast first to make sure there is no frost predicted. 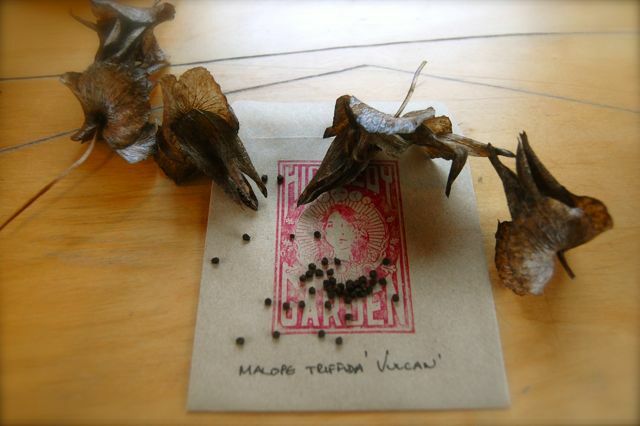 Malope Triffida ‘Vulcan’ Seed Harvesting. *They like lots of sunshine….and who can blame them. “After the summer flowering season, annual mallow plants develop seed pods. As the seed pods mature, they turn from green to pale brown and start to split open. To collect the seeds, simply clip off the seed heads and remove the seeds from the seed pod. Just make sure to store the seeds in a cool, dry place through the winter to prevent mould. 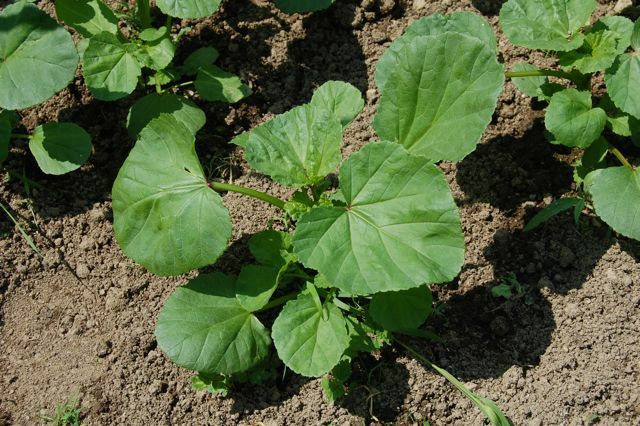 Annual mallow seeds are pointed and slightly grooved, and each seed pod is filled with multiple seeds.” Homeguides.com USA. When To Sow Annual Flower Seeds. A Bee Friendly Cutting Patch From Seed.